10 Tips For Limiting Your Kid's Screen Time! You are here: Home / Family Living / Parenting / 10 Tips For Limiting Your Kid’s Screen Time! 10 Tips For Limiting Your Kid’s Screen Time! Are you a distracted person? A distracted parent? I am so guilty of this and am working on getting better. 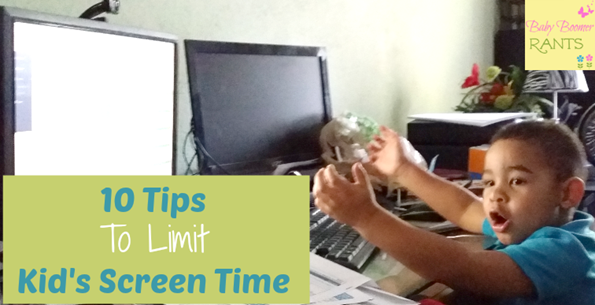 So, I thought I would share 10 Tips To Limit Kid’s Screen Time. When I was growing up and when most of my kids were little we didn’t have instant internet access, or cell phones and tablets that do everything. It made it at lot easier not to be so distracted. I carry my phone everywhere I go, it is on my nightstand at night, on my desk during the day and if I am walking anywhere it is in my hand. It dings, and beeps, and vibrates all day alerting me to different things, emails, texts, Facebook messages, phone calls, calendar events, and much more. We are raising distracted kids, too. We give them our phones, and tablets, and even buy them tablets of their own! My 3 year old grandson has his own tablet a Nabi. While I do think they can be helpful in keeping kids entertained and actually in learning through games and educational apps, as well as helping develop their motor skills, I think like anything too much of a good thing can be bad. Besides being distracted and unable to focus on things outside of their “screens”, the fact that they are spending more and more time inside playing games that require very little movement often leads to childhood obesity that has become a terrible epidemic! So, the easy solution is to limit their screen time, right? Limit the computer, tablet, phone, and TV time, all good things, but, we have to replace that with something else, or else they become bored, whine and we give in. We often say to them, “When I was a kid I played outside and rode my bike…”, but, have we taught them how to do that? Have we taught them how to play by themselves, or “outside”, do they even know what “go outside and play” means? We did. We found things to do, because we didn’t have the screens that fill our time now. Also, and this is the hard part, we lead by example, which means limiting our own screen time, right? So we see the problem, how do we handle it well? I know that as a homeschooling Mom of 4 people often “worried” that my kids would be unsocialized. I believe there is a far greater chance of kids being unsocialized due to excessive screen time than due to homeschooling. Make a media use plan, including mealtime and bedtime curfews for media devices. Remove TV’s and computers from children’s rooms. That will give you better control over how much and what they are watching on TV or the internet. We all know we are more likely to eat more while watching TV or playing a game on the internet. This sets kids up for bad habits in their adult lives. Dinner is a great time to be together as a family and talk and interact with one another (socializing). Screens are a big distraction during homework even if someone else is watching and not the person doing homework. Board games, outdoor play or walking, bike riding gives them and you exercise and fresh air. Did you know that there is a large percentage of vitamin D deficiency in the US? Because everyone is inside on their “screens” and not outside in the sun. To remedy this my personal Dr recommends 15 minutes a day outside. Your body naturally creates vitamin D when exposed to the sun. You can limit their time on the computer and TV with parental controls, you can also block access to things they shouldn’t watch alone, or before you have had the chance to screen it. Once your activity (game, show, video) is over turn off the screen and do something else. Be sure to talk with your kids about what they watched or what they read online, it’s a great way to keep the lines of communication open all of their lives, if you can enjoy the same shows, movies, and things on the internet. Make a time limit discuss how they plan on to spend that time and then adhere to it. My kids ALWAYS thrived much better on a schedule than not. That time should be for relaxing and winding down. Do you find that your kids or you are distracted by screen time? What advice do you have?